Have you ever been watching television and the commercials that air are filled with advertisements for prescription drugs? High cholesterol, blood pressure, diabetes, arthritis – it seems that every ailment has a myriad of medications just waiting to be your cure-all. Though after you hear the litany of potential side effects they rattle off at the end of the commercial, you can’t help but think it’s a Faustian bargain. 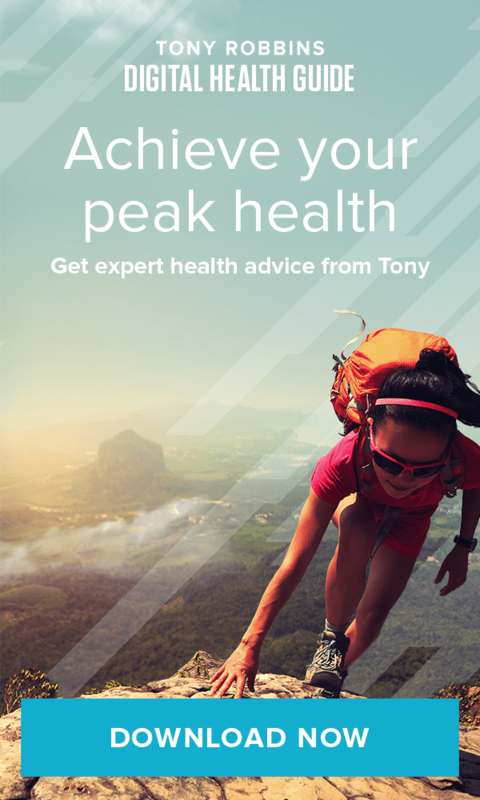 What if you could help address your ailments in a more natural way? What if there was a more holistic approach to wellness that didn’t come from the lab, but from the earth? After all, of the 3,000 plants identified by the U.S. National Cancer Institute as active against cancer cells, 70% come from rainforests. And approximately 7,000 medical compounds prescribed by Western doctors are derived from plants. So it would make sense that there exists a more natural way of approaching health. In no way is this meant to discredit Western medicine. There are a vast number of technical and pharmaceutical advancements that have been invaluable, improving and even saving countless lives. What this is meant to do, however, is to shed light on ways that we can incorporate plants in our everyday lives to improve our health well-being. Chances are, you’re already doing a lot more than you may realize. Every time you consume fruits and vegetables, you are fueling your body with vitamins and nutrients that give you energy, help ward off disease, and have a number of other beneficial effects. You may even be making a more concerted effort, incorporating well-known superfoods like açaí, blueberries, quinoa and kale into your meals on a regular basis. But if you want to take your health to the next level, then we have a list of four foods that are veritable powerhouses of vitamins and nutrients – helping your body find more energy and stamina, fight disease, decrease inflammation, improve your digestive health, and even strengthen your cardiovascular system. Sure you’ve heard of the red raspberry, but have you heard of its cousin, the black raspberry? Black raspberries have the same health-enhancing compounds and antioxidants as other berries (which have been shown to help prevent cancer, heart disease, stroke and possibly Alzheimer’s), but they have an edge over all their counterparts when it comes to their exceptionally high levels of anthocyanins. Anthocyanins are what give the berries their rich color and their impressive vascular-protective properties. Studies have linked anthocyanins with improved cognitive function, cardiovascular health, memory retention, cancer prevention and reduced cholesterol. 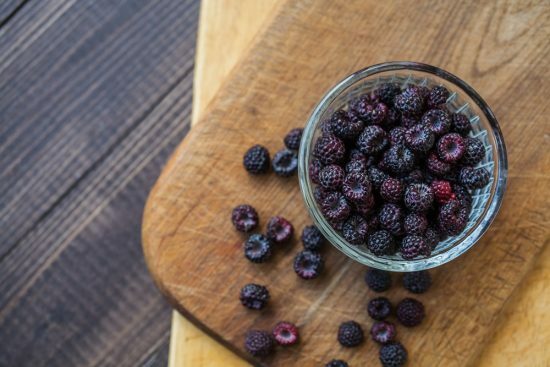 Black raspberries also have cyclooxygenase-inhibiting activities, much like common over the counter anti-inflammatories such as ibuprofen and naproxen. But the anti-inflammatory properties of the berry aren’t just limited to reducing inflammation in your joints. A 2012 study found that just 10 days of consuming black raspberries helped reduce the level of inflammation in colorectal tissue. Also known as Indian Mulberry, the noni fruit has been around for thousands of years. Across the South Pacific, the fruit has long been used to treat just about every condition imaginable. But over the past decade, it has been gaining widespread popularity as an alternative medicine – helping lower cholesterol, reduce inflammation, boost gastrointestinal health and even help fight cancer. If you have aching joints and arthritic pain points in your body, noni may help alleviate the pain. Research has shown that noni puree helps reduce pain sensitivity, and can even help decrease pain and join destruction by arthritis. 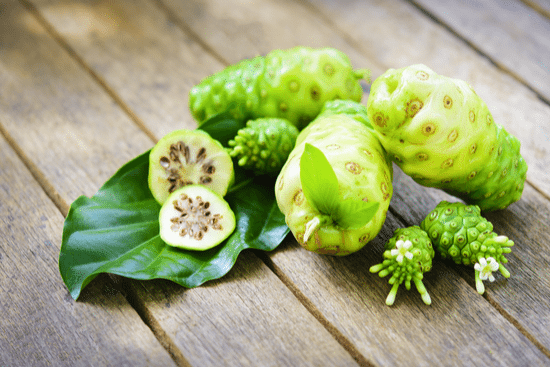 Noni is also packed with a large amount of nutrients that help inhibit the growth of cancer cells – like anthraquinones, glycoside compounds, limonene, nitric oxides, phytonutrients, polysaccharides and soluble and insoluble fiber. Fibers not only help clean the blood, they also help lower cholesterol and strengthen the health of your digestive tract. Aside from cancer prevention and gastrointestinal health, noni juice also enhances your general sense of well-being. It is high in essential fatty acids, which help keep our skin and our blood vessels health. It has selenium, which is an anti-oxidant. It has scopoletin, which helps you maintain a feeling of wellness. And it has terpene, which helps your body restore cells and eliminate toxins. The ideal way to consume noni fruit is either in its rawest form – juice or leather. While the versions that have been diluted with other fruit juices or sweetened with sugars may be more palatable, such additives will ultimately cancel out the health benefits which would be counterintuitive. Just be warned, the smell and taste of noni fruit is intense. But the benefits make the brief cringe well worth it. 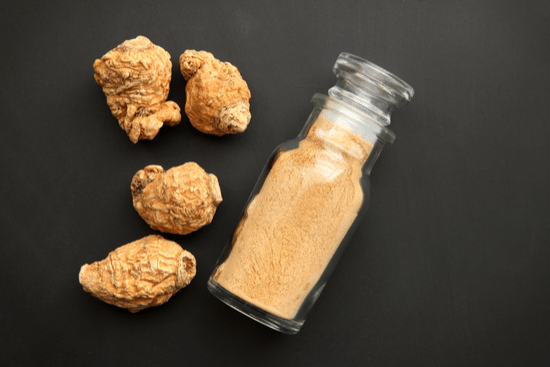 You may have heard more about maca in the recent years – no, not matcha, the similarly named counterpart made from green tea leaves – but the root vegetable from the Andes mountains of Peru and Bolivia that is chock full of vitamins and minerals. Maca has exceptional stress-fighting properties. It can boost your energy without the jitters associated with caffeine, and it can also have a positive effect on hormone balance. Maca itself tastes pleasant, and is usually available in powder form. Those who regularly use maca powder — adding it on a regular basis to smoothies or yogurt, for example – report having more energy, stamina and endurance throughout the day. Maca also helps enhance fertility. Many women struggle with hormone imbalance. Estrogen levels that are either too high or too low can not only make fertility an issue, but can take a toll on your mood, causing you to be anxious or even depressed. Maca is believed to help control estrogen levels in women. And for men, maca has been shown to improve sperm production, mobility and volume – which are all important components of enhancing fertility. Extremely high in calcium, vitamins B1, B2, C and E, maca is also a great source of magnesium, potassium, copper, zinc, manganese, phosphorus, selenium, sulphur, sodium, iron and phytonutrients. It has also been shown to increase the levels of glutathione in the body, helping improve immune function and disease resistance. You may have heard of the elderflower plant. But what about the elderberry? This fruit of the elderflower plant has a sharp, yet sweet flavor, but it’s jam-packed with vitamins and nutrients that give it a superfood status. 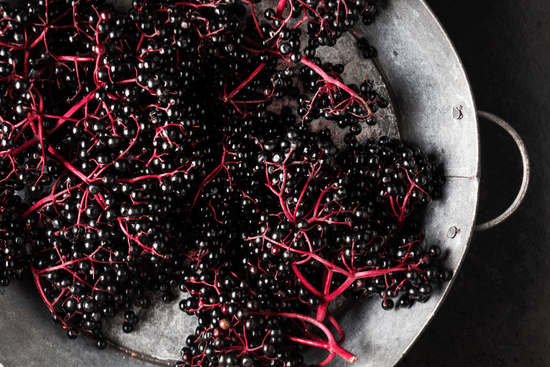 Just a single serving of elderberry contains nearly half of your daily requirements for fiber. Fiber aids in gastrointestinal health – helping relieve constipation and reduce excess gas. Fiber also helps flush out excess cholesterol from your body, helping improve cardiovascular health. Elderberries are also loaded with anti-inflammatory compounds that help relieve joint aches and pain from inflammation, while its high levels of essential minerals strengthen bones and support bone tissue growth. The bioflavonoids present in elderberries boost the body’s immune system by increasing antioxidant levels and viruses that damage cell walls. On an even more practical level – studies have shown that elderberries not only have antiviral properties, they can boost the immune system to help alleviate the symptoms and bring relief. In fact, in the 2000 Mosby’s Nursing Drug reference for colds, flu, yeast infections and chest congestion – elderberry is listed as a natural antidote. A word of caution – few species of the elderberry are actually edible. Do not pick wild elderberries! Most uncooked berries and other parts of plants are poisonous. Be sure that you go through a licensed and reputable source. And if you are struggling with kidney problems, stay away from elderberry, as it’s also a diuretic and may exacerbate the issue.